You can follow our smoking thoughts and ideas on Facebook or Twitter.
" ... thank you for such a fantastic time last weekend we are still buzzing from it! "I just wanted to say a massive thank you for a fabulous weekend at the ‘Castle Court Smokehouse’. I thoroughly enjoyed every minute of the course. I cannot help but think that the world of commercial smoking has lost out, but that the knowledge and experience that you are willing to share on your courses is a delight and privilege to all who attend. "Thanks for a great day out - we all really enjoyed it. Richard couldn't wait to use the cameron smoker and, in his enthusiasm, smoked us out of house and home! (think he'll be a bit quicker to turn the gas down next time . . . and maybe not overload it by filling it with chops, sausages AND peppers!)" "Thank you so much for this last weekend at the Wild Boar, it was fantastic. Can't wait to start smoking at home." "Many thanks for a very enjoyable smoking weekend. Really informative, tasty and fun couple of days! Great hosts and the group was good company. Thanks again and I have already recommended the course to family and friends!" "First of all, thanks for a great weekend. It was a lot of fun with a pretty good bunch of people and it was good to meet both of you. And you were right (of course) about our palates being a tad overloaded yesterday; we've just had the chicken with pasta, some pancetta and a bit of parmesan... Blimey, but it was good! I can see a busy weekend coming up playing with my new [smoking] toys." Thanks again for a wonderful weekend. It was great to meet you both and have so much fun learning 'how to smoke'. Thanks for all the photos, what a lovely reminder of it all. We used the Aga top smoker tonight for tea with salmon! Tasted good, but I think I left them 'curing' a little too long as the salmon was a bit salty! But that's the fun of trying, I'll reduce the time next time! A huge thank you for the smoking course yesterday which proved to be a very successful Christmas present. Ian enjoyed every moment and learnt so much. He was very impressed with your professionalism and has already requested the book* for his birthday! We wish you continuing success. * Our book - "Smoking Food at Home with Smoky Jo" is now available! "We had a great weekend at the Wild Boar with Georgie and Jo. The course wasn't too technical or stuffy just great fun, common sense stuff with amazing food - all made on the day in the cold smoker and hot smoker. We leant how to cure food and how easy it is to cold smoke virtually anything. Cheese, chocolate, fish meat, and many left with the idea of trying to smoke pineapple and peaches. I would definitely recommend the course to all foodies. Georgie and Jo are a great double act and full of knowledge. Chef at the Wild Boar did amazing things with our smoked food on the Saturday night, there was plenty of wine and 11 happy people. Thank you so much for a great weekend. " Jenny Cutler came on a course in June and wrote a wonderful piece about us in her blog. "I don’t get much time in my hurried life to do this sort of thing... but I just wanted to let you both know what a thoroughly enjoyable day I had with you this week on my Smoking course. You both made it so much fun and best of all the food was FANTASTIC. Having known absolutely nothing before I came I really felt I picked up a lot on the day. I will now torture the family with my incessant ‘experimenting’ here on in.!!!! "Thank you for an absolutely wonderful day. We both said later that it was one of the best times we have had for along time"
It was a great weekend-one which we will not forget, especially the fishing! A wonderful and enjoyable day - we have learnt so much. Innovative and imaginative and very inspiring - Thank you. What fantastic fun. 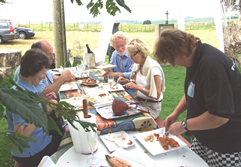 We had a wonderful weekend doing the things we enjoy best - food, wine, excellent company, learning, great surroundings. Complete smoking novices - you made us feel at ease and were great fun. Thanks guys! Fantastic experience, fantastic hosts, fantastic company - made more fantastic by amazing food! Perfect in every way - thank you so much for a wonderful, fun and informative day - sausages here we come! Thanks for the course last week – we had a ball, learnt loads and will be getting ready now we are home to start smoking! Many thanks to you both for a really good weekend; learning something new, tasty food, lots of laughs and a great atmosphere. Many thanks for a great course yesterday, I thoroughly enjoyed the course, the wit, your knowledge and the amazing food. This course was the best birthday present I have ever had! Excellent course, Glorious day, Enthusiastic knowledgeable people, what more can I say ? I now have two of the books recommended on the course notes, although they are very detailed, they cannot start to the replace the hands-on experience of the course. A very educational and entertaining day, thank you. I would just like to say thank you very much for a fantastic day last week, along with the gorgeous food you cooked and supplied us! I found the course extremely useful and easy to follow and have since been smoking myself. Thank you for a great day on Thursday, I really enjoyed it, and everyone loved the taster’s I brought home – especially the sausages and brie! Just a very short note to thank you both for a most entertaining and informative day. What a delightful learning experience and venue. We had an excellent weekend, I learnt lots. The food, accommodation & views were perfect. Thank you for a wonderful and inspiring day. It has been the best birthday present I have received! "You have a winning formula, its been a really special day". "Thank you very much for a really enjoyable day. The tuition and organisation were excellent, the environment perfect and the company and food brilliant". "Ellie and had a wonderful time on the course. It's so rare to look forward to something as much as I was and then have it actually live up to and exceed your expectations. I know Ellie felt the same. We enjoyed your company and the setting as well as the course - as well of course as the chickens and the peacock and not forgetting the wonderful Freddie". "Couldn't wait to tell you how much I enjoyed today's smoking course. I had a huge expectation ever since being given a voucher as a present, your letter giving details for finding Castle Court and explaining what I needed to bring - basically nothing except a sense of humor - added to the anticipation. With all of that, it would have been all too easy to be disappointed. In the event that wasn't what happened. Quite the reverse in fact as the day exceeded all my expectations. The company was great, the organisation and course content were perfect and the results - the food in enormous variety - was delicious. After all that, it seems lame simply to say 'Thank you' but I do most sincerely. I was delighted with my children for buying the voucher and you made it all even better". "A very big thank you for the lovely, interesting and informative day we spent with you last weekend on your food smoking course. The lunch was superb and it was marvelous that you tailor-made the whole course to our needs. 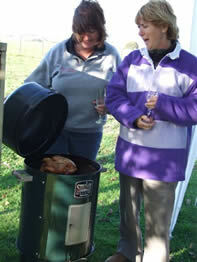 We have no hesitation in recommending the course to anyone wishing to learn more about the art of food-smoking". "Even though I have been smoking fish for a number of years, I learnt a lot and had so much fun doing it. I certainly recommend the course to anyone who enjoys good food and good company"
"Fantastic, great fun, really interesting and informative. I like the fact that everything we did at Smoky Jo's I can do at home. It was great to sit down at the end of the day and taste everything we had smoked." "We cannot thank you enough for a wonderful fun filled, educational and stimulating course. We learnt so much and in the process had a fantastic time. We would thoroughly recommend this course to anyone interested in smoking food, you made the experience easy and enjoyable, and your hospitality was first rate". Learn how to smoke food with Smoky Jo's. 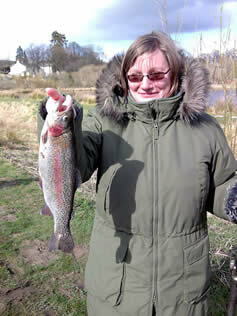 Anne with her first fish caught at Bessy Beck trout fishery.